Africa Rocks Expo: Discover Why Africans Rock! Walking into Level 2 Gallery at the Tate Modern, one of Britain’s foremost art landscapes to view Contested Terrains, the first thing that comes to mind is why are the halls empty? This is an exhibition that is supposed to be breaking down artistic barriers and bring talents from the African continent to a global audience. The fact that Level 2 Gallery is the Tate Modern’s ‘dedicated space for emerging and recently established international artists, and serves as the platform for bilateral collaborations with other art organisations around the world,’ would at least stir up some excitement from art lovers. But on this particular day, the case is the reverse. Nevertheless, Contested Terrains is an exhibition of creative ingenuity. You are instantly immersed in the first set of portraits by Adolphus Opara from Nigeria. It feels like a private viewing, where you can have an intimate conversation with the artists. An exhibition of recent work by four contemporary artists working in Africa, co-curated by Tate and the Centre for Contemporary Art, Lagos, it is the first time the Tate Modern has collaborated with an African based art institution. Through their work, ‘the artists reclaim and subvert assumptions about Africa’s past and present, exploring current political and social concerns both at a domestic level and across the world.’ The others artists, whose work was also on display include: Sammy Baloji, Democratic Republic of Congo, Michael MacGarry of South Africa and Kader Attia, a French-born artist of Algerian descent. 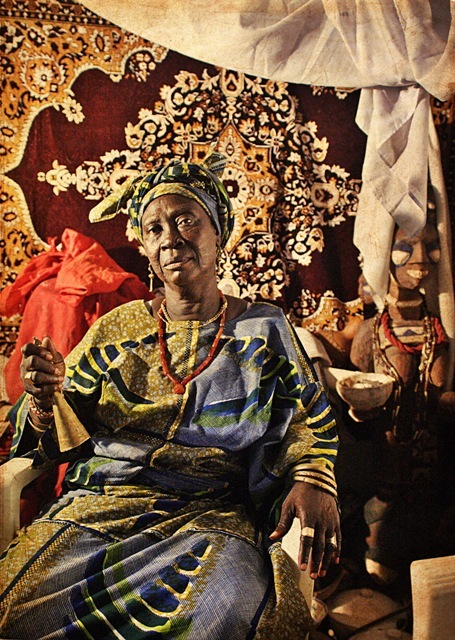 Baloji’s use of photography to explore history is equally as mesmerising as Opara’s homage to Yoruba diviners. In his photomontage, he uses the mining company, Gecamines, founded in 1906 by Belgian colonisers, later taken over by the late Mobutu S’sese Seko’s government in 1966, as the foundation for his story. Skilfully, he superimposes archival images of European officials and Congolese labourers who built the mine in its glory days over the images that depict the current state of the mines. What glares at you is the decline in productivity and what we end up with is a metaphoric journey about the political and economic decay and ruins the DRC as a nation has experienced in recent times. The layers of meanings in Baloji’s images once again reminds us about the hunger for natural resources, push for industrialisation and the exploitation that comes with imperialism and in today’s world, the greed of global capitalism without consideration of its aftermath when it is not seen through. Opara, Baloji, MacGarry and Attia, successfully demonstrate thorough their work that history is an excavation process and is never a smooth sequence of events. Whatever the outcome, history remains an area of contested terrain that forces us to ask who owns it? Those, whose story it is or those that document it. In fact, can anyone own history? Contest Terrains, in spite of its originality and ingenuity raises questions about the accessibility of modern contemporary African art and how it is been perceived and received. Contested Terrains was at the Tate Modern,London. It will be at the Centre for Contemporary Art, Lagos, from January 21 through to March 3, 2012. This entry was posted on Wednesday, October 19th, 2011 at 11:55 pm	and is filed under Africa, Art and Culture, Nigeria. You can follow any responses to this entry through the RSS 2.0 feed. You can leave a response, or trackback from your own site.